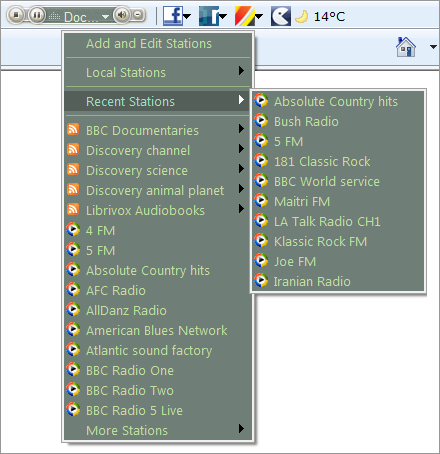 Streaming Internet Radio toolbar-Get easy access to thousands of online internet radio stations. Listen to full albums for free, legally. Search the internet with ease using our inbuilt search form. Play over 12000 games and share your scores on Facebook. Customise your installation with a choice of over 13000 free gadgets. Contains popular social networking tools, including Facebook, Twitter, MySpace and much more. Bookmark your favourite websites with our social bookmarking tools, including Delicious, Digg, Google bookmarks and more. Contains many tools, such as Imageshack uploader, Screentoaster, Anti virus scanner, and more. Translate to multiple languages, spell check and dictionary tools. Pop up blocker and cache cleaner. Email notifier allows you to keep in constant contact with your friends. RSS feed reader brings all the latest news into your browser window. Add your own RSS feeds. Keep up to date with the latest weather forecast for your region. This is the ultimate browser addon. Record internet radio, all online music, especially DRM music. Qweas is providing links to Streaming Internet Radio toolbar 10.4.1.25 as a courtesy, and makes no representations regarding Streaming Internet Radio toolbar or any other applications or any information related thereto. Any questions, complaints or claims regarding this application Streaming Internet Radio toolbar 10.4.1.25 must be directed to the appropriate software vendor. You may click the publisher link of Streaming Internet Radio toolbar on the top of this page to get more details about the vendor.